Finally there's an answer to a natural home remedy for sinus infection and look who agrees with Grandma! 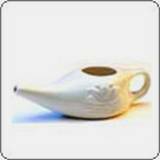 The neti-pot has finally gotten famous after Oprah and Dr. Oz showed a demonstration on her TV show. Dr. Andrew Weil , one of my favorite natural health practitioners, has suggested for years to use salt water and a neti-pot to keep allergies and sinus infections under control. The practice of nasal irrigation was actually originated in India and now in the United States and Europe the practice is getting more popular by the day. Especially since viewing the benefits of this natural home remedy for sinus infection on Oprah. In the United States sinus infection is the number one reason people see a Doctor. It's no wonder TV commercials and drugstores are making record profit on all the various brands of decongestants and cough syrups. You can't open any newspaper, magazine, or turn on the TV news media without seeing one medication after another being recalled because of dangerous side effects, yet these same media's think nothing of getting paid to advertise these drugs. Do a little research on the drugs you thought was safe to give your kids a few years ago, how many times did you try to relieve your child's allergy or cold symptoms at night with these medications? I wouldn't be surprised if they were recommended by your family physician. Of course you thought you were giving your child the best of care. Now you're told how dangerous it is to give these drugs to your child. Another signal that these drugs are dangerous is now you have to sign your name and show identification before buying these decongestants or cough syrup. Look how many teens are finding they can get high on the same drugs you gave your toddler! My best friend was talked into getting a sinus operation for her sinus infections. She suffered so much pain after the operation, she suffered for months. And you know what? It didn't do a bit of good for her sinus infections. It's time we get back to the basics. 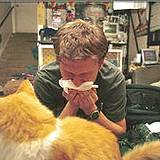 It's time to find new solutions to relieve symptoms to allergies and sinus infections. Of course the neti-pot couldn't be used on toddlers but you could use a saline mist, which can be found in any drug store. It's nothing more than salt mixed with distilled water. It will flush out the pollution, dust, pollen and other irritants. You'll be pleasantly surprised at the difference this simple home remedy for sinus infection can quickly get your breathing and allergies under control. You can also make homemade nose drops for your toddler out of a simple saline solution. A Neti-Pot looks a lot more uncomfortable to use than it actually is. The benefits of a home remedy for sinus infection far out weighs the side effects of dangerous drugs. Fill the NetiPot with 8 oz. lukewarm water. It's important not to use hot water or cold water, the water must feel comforting to your body temperature. Mix ¼ teaspoon of sea salt into the lukewarm water. Never Use Iodized salt it will irritate your nostril lining. Tilt your head to the side, as shown in the picture above. Insert the NetiPot Spout into the raised nostril creating a seal between the nostril and spout. If the water spills out your mouth lower your forehead and relax. Try to keep calm the water will flow straight through to the other nostril and out. Don't try to force it, it will flow naturally if you can relax and breath through your mouth. Raise the NetiPot slowly to allow the saline solution to flow through your top nostril and out your bottom nostril. When you're done exhale firmly and repeat several times to clear out the sinus cavity. Repeat the process by tilting your head in the opposite direction. Once you try this technique you'll be pleasantly surprised at the health benefits. It's not only the best home remedy for sinus infection it's also extremely beneficial for upper respiratory tract infections, chronic sinusitis and allergies. Until you try it yourself you're just going to have to take Oprah, Dr. Oz and Dr. Weil's word for it. But most important, trust in Grandma's Wisdom.